Description: Wireless Mesh Networking Is A New Technology That Has The Potential To Revolutionize How We Access The Internet And Communicate With Co-Workers And Friends. 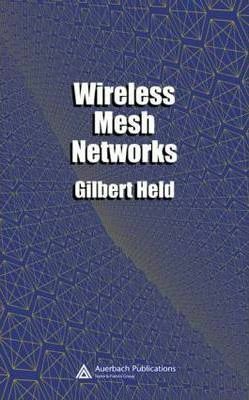 Wireless Mesh Networks Examines The Concept And Explores Its Advantages Over Existing Technologies. This Book Explores Existing And Future Applications, And Examines How Some Of The Networking Protocols Operate. The Text Offers A Detailed Analysis Of The Significant Problems Affecting Wireless Mesh Networking, Including Network Scale Issues, Security, And Radio Frequency Interference, And Suggests Actual And Potential Solutions For Each Problem. Although The Book'S Primary Focus Is The Potential Use Of Wireless Mesh Networks In The Commercial Marketplace, It Enables Readers To Gain An Appreciation For Use Of The Technology In The Office, At Government Agencies, On Campus, And In The Home.